Tis a pity he had to lose a leg, but that's what happens when you stare at your mustache reflection on the surface of the alligator pond. The polite thing for the other brother to do would be to sit down. 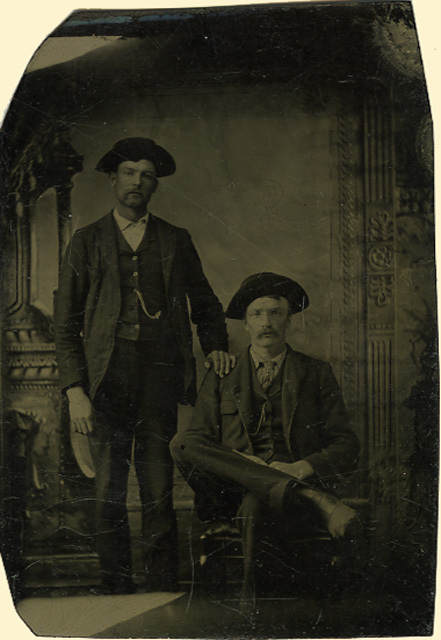 Didn't mustache-wearers in the 19th Century have any manners? But what of the Monkeystache? There's more 19th century mustaches here than I can shake a stick at...! Your comments and the information that you have displayed are both interesting and highlighting. Obviously the standing twin is the dominant one. He forced the mustache on his younger, one-footed brother and then towers above him in every picture taken of the two of them. I have been looking out good information about this matter for some time and I got to say you put up provides me some general concept about my paper I'm going to write for my assignment. You are really a good webmaster. The site loading speed is incredible. It seems that you're doing any unique trick. Moreover, the contents are masterpiece. You’ve done a magnificent job on this topic! You should see the mustaches sported by kings from India. They were really lengthy. Wow! Love this vintage photo. There seems a kindled spirit between them, not just the mustache that they both share, eh. Sporting and maintaining a good mustache is hard work! Daddy dearest, i fell in love with two dead men. The power of the 'stache. I love this! I'm actually trying to find the best mustache in Athens, Ohio right now. If you're a mustache lover, check out the competition! i like is beatiful men!!! Why have you stopped blogging? Please start again. Didn't mustache-wearers in the 19th Century have any manners? Life supports me and brings to me only goods and positive experiences. It's good to know that there memories are still alive. I really enjoy your web site and will use this as being a reference for additional teachings with my daycare center little ones. Thank you for obtaining this webpage. Hello, I too have added a blog post at http://one-stopbeauty.com/mens-corner about grooming your mustache. Please go take a look and also if you'd like, leave a comment, I do love to get other people's feedback/opinions. These are some seriously awesome mustaches! These guys know how to do it for sure. I am working on my mustache right now, but one day I hope it will be as great as these men's mustaches. DID JOHN WILKES BOOTH USE MUSTACHE WAX EVERY DAY?